Today is the day of love! Otherwise known as Valentine's Day. I don't have any strong traditions for Valentine's Day. As a child, I loved writing greeting cards to pass out to friends and classmates...but more so because I loved the task of crossing off a name as I wrote it out on the tear-out cards. (Dorky much?) I also enjoy the fact that there is love-inspired candies in the stores (it makes for pretty packaging). But, before I met my husband the holiday reminded me of how lonely I felt because I didn't have a "special someone" to share the day (or any other day) with. Of course, my best (single) friends and I would get together and celebrate in the silly, girly way that gals do. And of course, the holiday wasn't in existence to make a person feel worse. But, when every commercial and store ad is geared towards couples, and you're not a part of a couple, a person can feel pretty badly about herself. Especially for no good, logical reason. Questions loom like "what's wrong with me?" Or, "why aren't I with someone?" Fast forward to the present day, and here I am. I'm a part of a couple and I am reminded by my husband that there is someone special to share the day (and everyday) with. It didn't take hell freezing over to get here. And there is nothing with me. But, to get here I had to let go a lot of the negative. When I finally believed that I could just be myself, people noticed who I was instead of who I was trying to be. I know this sounds shamefully cliche, but it really worked for me! It just took a long and enduring process to get myself to understand what the cliche actually meant. On a day when moments can become over-the-top and corny, I hope you are enjoying it the way you want and are with the people you love. Happy Love! Love the pinks together! Happy Valentine's Day and thank you so much for your sweet comments on our blog! WOWWW love your look! this outfit is absolutely pretty!! 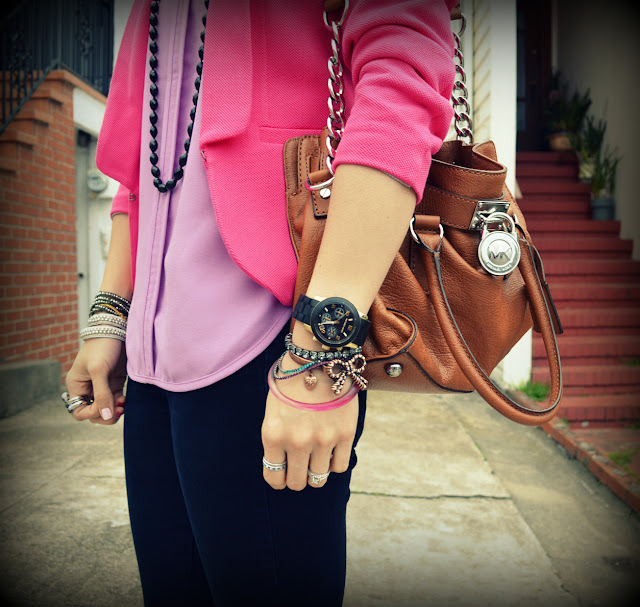 i love how you paired these colors together =) i also love all your jewelry. such a sweet valentines outfit! happy valentines day. I love the colors in this outfit, they all look so great together--and all the jewelry gives it a sweet edge. xoxo! This is such a casual yet stylish oufit. It makes one wonder where you're going-. Thanks for posting the photos and feel free to drop by me too when you have time. Pink and lavender - superb! So Valentine's-y...like those candy shaped hearts. Love it! LOVE the different shades of pink! the blazer is great! very cute Vday outfit!!! loved the pinks. love it! 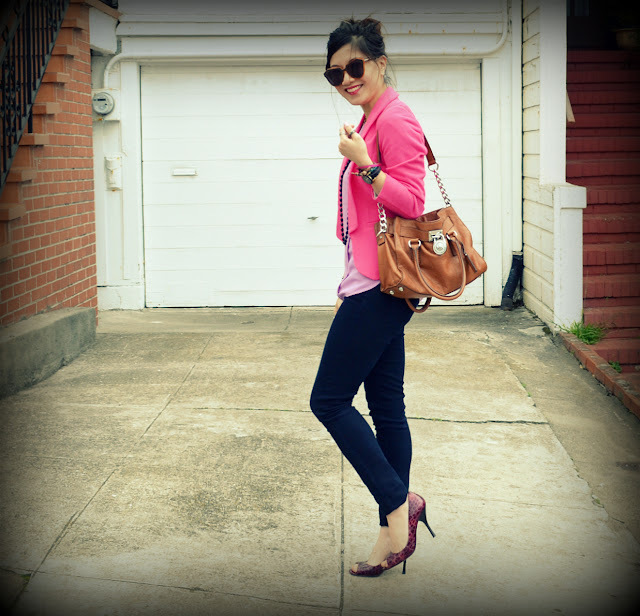 so glad i found your blog, your style is adorable! 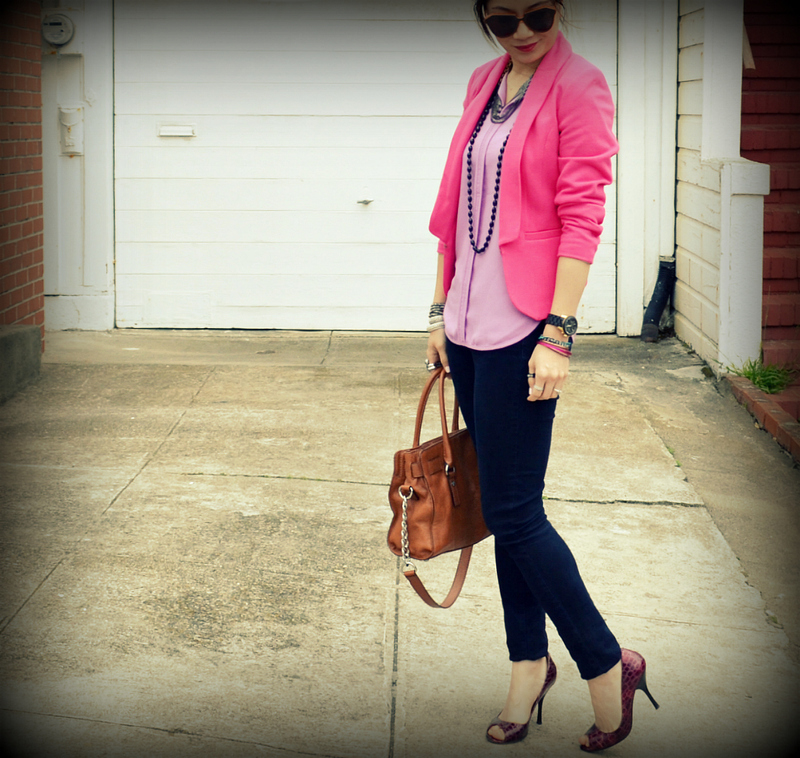 Love the pink blazer so simple but so cute! !